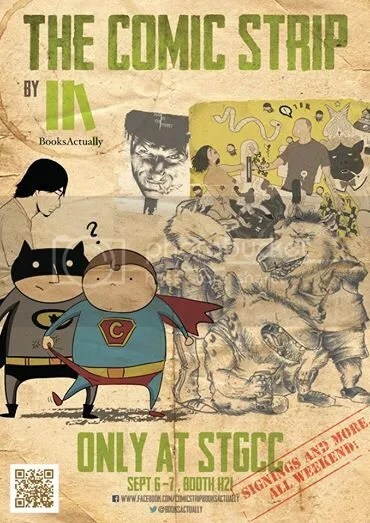 The Comic Strip, an imprint by BooksActually, debuting at STGCC 2014! First off, I’m definitely stoked for The Comic Strip, an imprint by Singaporean bookshop BooksActually, which has been a staunch supporter of the literary scene in Singapore. I’m more than happy to see that they’re now extending that support to local comic creators too! They’ll be releasing five brand new books for their debut at STGCC 2014, namely: Tales from A Tiny Room by Wayne Ree (and collaborating artists), The Unsavoury Alphabet by Gene Whitlock, The Adventures of Fatman and Superchub by Stephanie Raphaela Ho, A Wonderful Life by Kenfoo and Adrian Teo, and the book I’m looking forward to the most: the long-awaited 6th volume of Troy Chin’s The Resident Tourist. 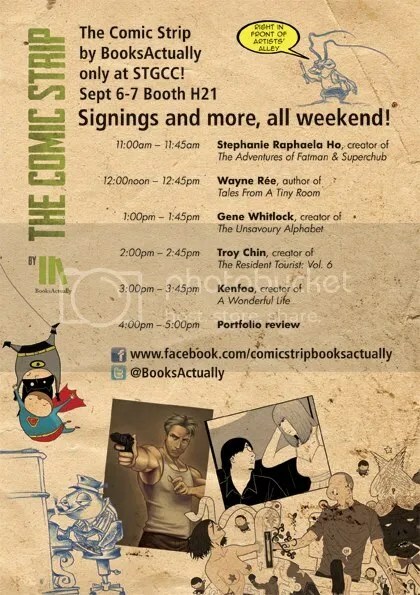 You can catch the artists and have them sign your books by referring to the signing schedule below! 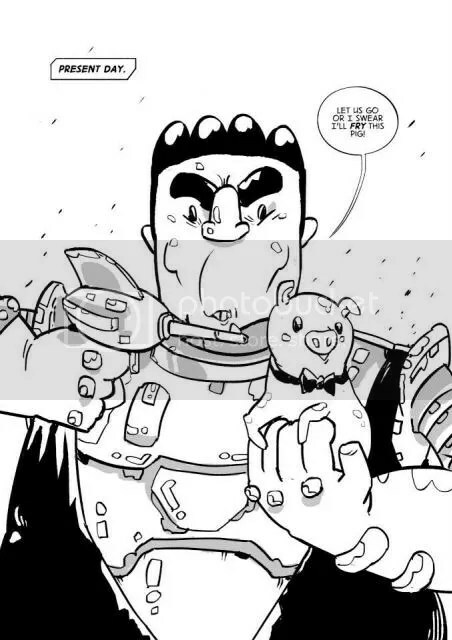 Here’s the pitch: In a universe where Charsiew (aka Roast Pork) no longer exists, it’s up to an old lady chef, a space rouge, and his robot sidekick to bring this delicacy back onto the intergalactic menu! What’s there not to love? I’ve been a fan of Benjamin’s work since I was first introduced to him at my first 24-Hour Comics experience and subsequently a tag-team-comic get-together, and this will be his first solo book that he has self-published. 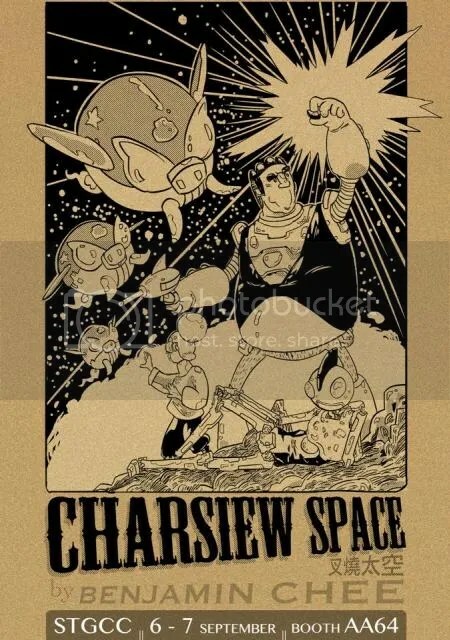 Charsiew Space Preview Page 1. Come on, that piglet implores you to buy the book, if only to watch it slowly being turned into a delicious savoury Chinese delicacy! 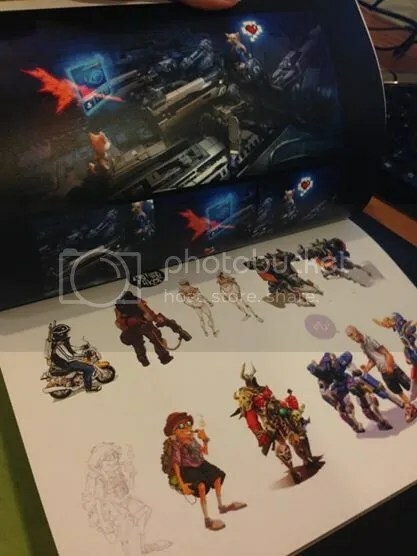 I managed to flip through the sample copy of the book when I met up with him at the Liquid City Volume 3 launch recently, and the print quality of the book is superb! At 60+ pages and going at only 8 SGD a copy, do grab yours quick at STGCC before it’s all snapped up, like really tasty Charsiew! 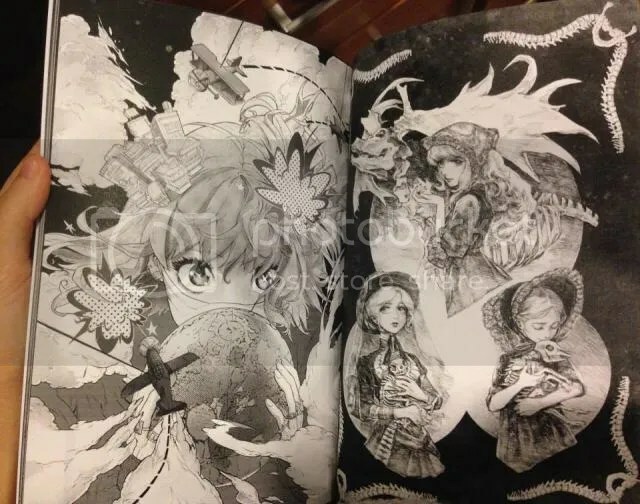 I happened to stumble onto the preview pages of this artbook on my Facebook timeline, and I was instantly hooked. I’ll let the pictures do the talking and let you decide if it’s worth the 16 SGD (or so I’ve been told) it’s going for (I think it is!). If you’re a fan of Rex Regrets on Facebook, you’ll definitely want to meet up with his minion (Jerry) that produces his artwork at STGCC! Though Rex Regrets to inform me that the physical copies of his book will not be ready for sale until next year, there will be postcards and T-Shirts that have been Rex approved for sale at the booth. 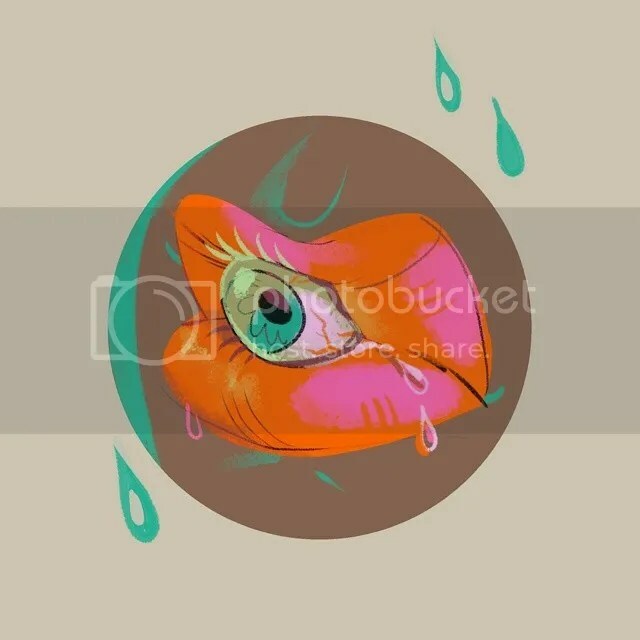 His minion will also be sharing the booth with one Annabella Goh, who produces whimsical, kooky artwork that live on in the form of badges and such (as evidenced by what’s available on their shared Bigcartel shop). They’re always glad to talk shop (especially about art woes), so do drop by their booth for a chat and tell Rex that Max sent you! Annabella has her eye on you. With that, I guess I’m done with the stuff I’m excited about for this year’s installation of STGCC. I’m pretty sure that there are some other goodies that I might have missed out (which every con-goer knows are a joy to unearth and stumble upon while browsing booths), so you might want to keep an eye on other blogs that have more comprehensive coverage of STGCC 2014 previews like Here Be Geeks and Reddotdiva! On a less comic-related note, I discovered today that Pop! will (finally) be releasing some STGCC Exclusive figurines, so that’ s a step forward in terms of the scale of this event, at least in my book! If you’re headed to STGCC this year, I hope you’ll have a blast and twice the amount of fun for my sake! Peace out!